Witness: Disaster, Rescue And Recovery – Anne Bradley – 13th July 2015. Anne is the cur­ator of Social and Oral History at the National Coal Mining Museum at Caphouse Colliery which stopped pro­duc­tion in 1985. Initially the site was known as the Yorkshire Mining Museum but in 1995 it became the National Coal Mining Museum for England. 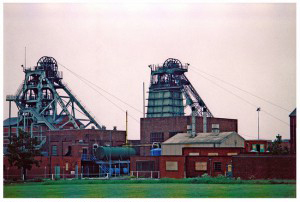 Coal mining was a major industry in the UK until the miners’ strike in 1984 – 1985 and the industry was one of the largest employ­ers in Yorkshire up to that date. It is hard to ima­gine but there are more than 1,500 shafts and bell pits within a 5 mile radius of the museum. Huskar Pit Disaster – 1838. 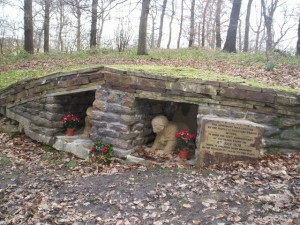 A Memorial To The Huskar Pit Disaster. Up to 1842 both women and chil­dren worked in the mines along­side the men. The men dug the coal, the women put it into bas­kets for the boys to fill the tubs. Very young boys worked as trap­pers, open­ing and clos­ing vent­il­a­tion doors and the older boys pulled and pushed the tubs. On the 4th July 1838 26 chil­dren died, mostly under the age of 12 due to flood­ing. There was a storm and a stream over­flowed and caused the flood­ing. The chil­dren were told to stay where they were, but when the lights went out they pan­icked and 40 of them decided to get to the sur­face by a day – hole. 4 escaped but the other 26 were trapped and drowned. The 1842 Mines and Collieries act banned all women and boys under the age of 10 work­ing under­ground, but there was only one inspector to see that the law was being obeyed. 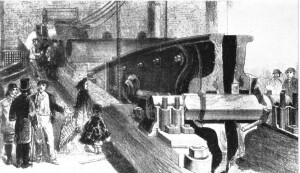 Hartley Colliery Disaster – 1862. An Etching Of The Fractured Cast Iron Beam. On the 16th January 1862 a beam weigh­ing more than 42 tons broke from the pump­ing engine and fell down the mine shaft onto the cage which con­tained 8 men 4 were killed but George Sharp who was still alive fell to his death as res­cuers tried to haul him to safety up the shaft. The mine shaft was blocked and this was the only way in and out of it. The pump­ing engine was broken and the mine flooded. 200 men and boys died from carbon monox­ide pois­on­ing. In August 1862 an Act of Parliament was passed requir­ing all new mines to have two entrances or exits and after the 1st January 1865 the Act was exten­ded to cover all exist­ing mines. In 1902 the first rescue sta­tion opened at Tankersley, Yorkshire, and in 1904 the sta­tion team, wear­ing breath­ing appar­atus, suc­cess­fully tackled an under­ground fire at Wharncliffe Silkstone Colliery. Rescue sta­tions opened all over the coun­try but in 1911 the Coal Mines Act was passed making it com­puls­ory for mine owners to provide teams of trained rescue men equipped with rescue appar­atus. Minnie Pit Disaster – 1918. 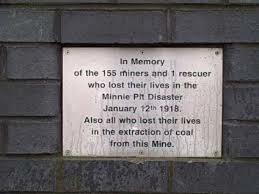 A Memorial Plaque To The Pit Disaster. On the 12th January 1918 there was an explo­sion in the Bullurst seam, caused by a build-up of meth­ane gas. The blast blew the coal dust on the road­ways into the air which then ignited. There were 248 men and boys work­ing under­ground and just 93 were saved. 11 were killed by the explo­sion and 144 died of carbon monox­ide pois­on­ing, making it the worst mining acci­dent in Staffordshire. Several rescue teams came from Birchenwood, Silverdale and Burley Collieries and the Birchenwood Rescue Team Captain, Hugh Doorbar also died due to a faulty valve on his breath­ing appar­atus. The dis­aster had a huge effect on the com­munity. The col­li­ery com­pany paid each widow £5.00 per man and £1.00 per boy lost, £3.00 per coffin was added and wages were paid to the end of the week. A mere pit­tance by any stand­ards. Creswell Colliery Disaster – 1950. On Tuesday the 26th September a fire broke out at Creswell Colliery, Derbyshire, killing 80 men. This was caused by a jammed con­veyor belt and when the fire broke out there were 131 men work­ing in the vicin­ity. 51 men escaped but low water pres­sure made it dif­fi­cult for the fire fight­ers to con­trol the blaze. 3 bodies were recovered after which a meet­ing was held and it was decided to seal of that sec­tion of the mine con­tain­ing the fire and it wasn’t until about a year later that all the bodies of the miners were recovered. They died of carbon monox­ide pois­on­ing and not from the fire. 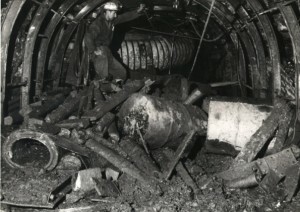 Lofthouse Colliery Disaster – 1972. Inside The Main Roadway After The Disaster. On the 21st March 1972 water surged into the South 9B dis­trict of Lofthouse Colliery. It came from a dis­used mineshaft sunk in 1831. It was known about but what wasn’t known was its depth and that it was full of water. As coal was cut from the face the water burst through sweep­ing everything in its path includ­ing heavy machinery. It blocked the main road way and the tail­gate trap­ping 7 men under­ground. The res­cuers had to drain the main road­way and get through a set of air-doors which were blocked with silt. There were over 200 men involved in the rescue and finally on the 27th March the res­cuers broke through, only to find the body of Charles Cotton. At the end of the tail­gate was a huge plug of mud and debris which blocked the way to the coal face and it was decided that it would be too dan­ger­ous to remove it for fear of caus­ing fur­ther flood­ing. The remain­ing 6 bodies were left under­ground. The talk went into much more detail, but this brief sum­mary gives a fla­vour of the dangers that miners con­stantly faced. Soon the last pit will be closed on a world than none of us can ima­gine. We must thank Anne for a very inform­at­ive but moving and sombre talk. Previous PostMy Type or True to Type — Alan Powell — 6th July 2015Next PostSheffielders on Holiday — Suzanne Bingham — 20th July 2015.